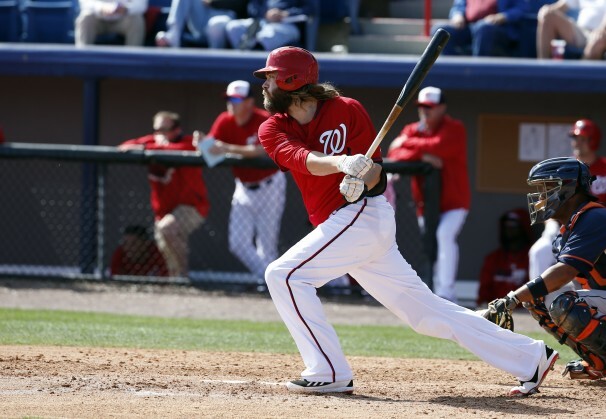 I first picked up on the Kevin Frandsen rumors Tuesday evening (3/25). I remembered seeing him playing with the Phillies last year, but nothing about him had really made a big impression on me. 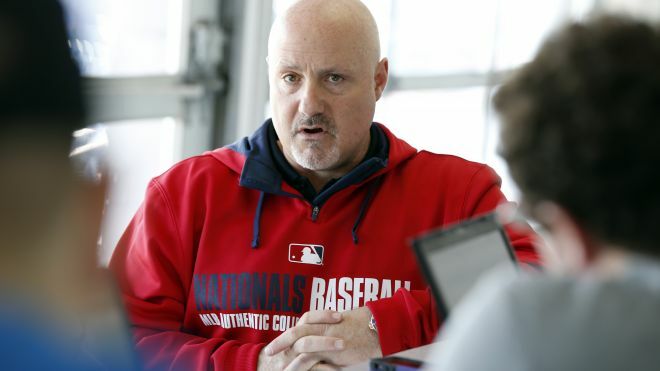 So I was very surprised when it came out that Mike Rizzo had snatched up Frandsen within 2 minutes of when the Phillies gave him his walking papers! I was even more blind-sided when not one but all three of Tyler Moore, Jeff Kobernus and Jamey Carroll were let go. Where I had been thinking the 5 bench players would be Carroll, McLouth, Lobaton, Kobernus and Walters,……….we now have Espinosa, McLouth, Lobaton, Frandsen and Hairston! 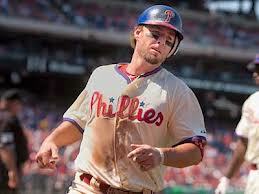 After doing a little research, it does appear Frandsen could turn out to be a good pick. He can play several infield positions and is a tough competitor who never gives up. Well, at least I got one pick right; Aaron Barrett made the bullpen🙂 And if Doug Fister’s arm turns out to be ok, we will learn who the 5th starting pitcher will be on Saturday, after the game. I think the team brain-trust has been very concerned recently about the bull-pen. In my opinion. THAT is the Nat’s weakest link right now, and is the main reason for the decision to put Detwiler in that key group. He has what is needed for that role, experience and high heat. 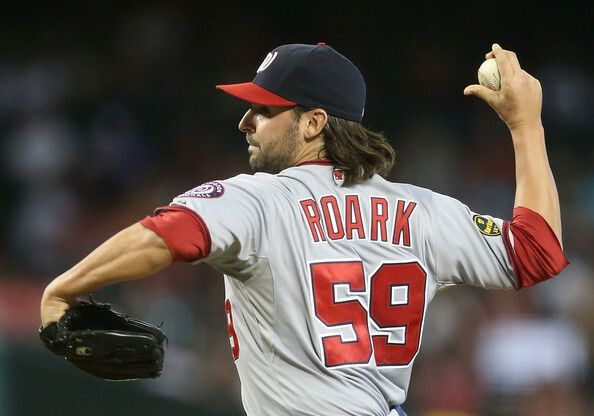 He also brings the pen a second lefty as well as the ability to play a variety of roles from long-relief as well as possibly closing a game or two. The way I see it right now, six of the seven bull-pen spots are set. 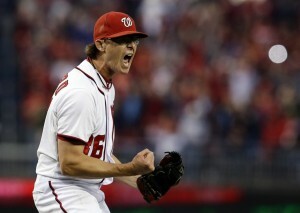 Here are my picks for those six: Soriano, Storen, Clippard (photo above), Detwiler, Blevins and Stammen. Unfortunately only two of this group have put up good numbers in spring training thus far: Blevins and Clippard. Soriano, the nominal “closer,” has looked like anything but that! The same goes for Drew Storen, the very effective closer a couple of years ago. So the chances are good that we may see Clippard closing games soon. So, are you wondering who has the inside track on the remaining bull-pen slot? Glad you asked:) Aaron Barrett. 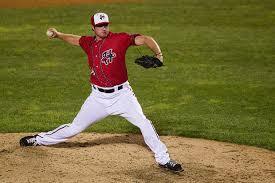 Aaron was the closer last year for the Harrisburg Senators, the Nats’ AA team. He had a great season in that role. He also played in the Arizona Fall league for the team Matt Williams managed! A look at the outstanding numbers Aaron has put up this Spring, and I expect to see him throw an inning in today’s game; it will be televised:) The team brain-trust is talking a lot among themselves about this guy, trust me! p.s. Click here to read about Clippard and the bobblehead campaign. It’s my story and I’m stickin to it! A chihuahua? 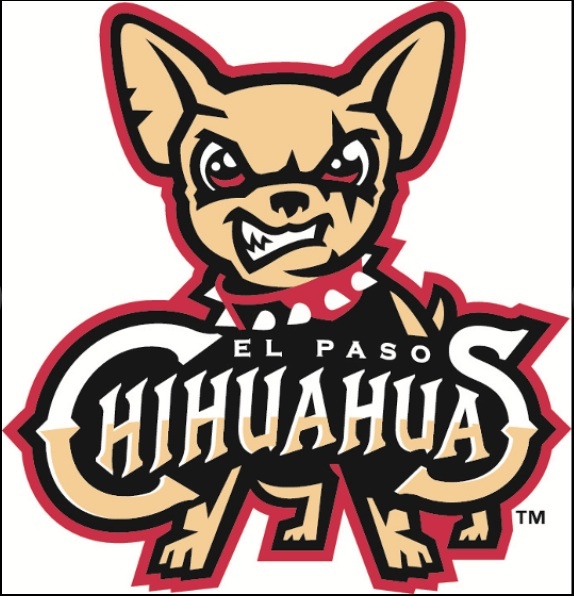 The newest AAA Baseball Team – the El Paso Chihuahuas. p.s. Single game tickets for the Chihuahuas’ first season went on sale yesterday. To learn more about the story behind their mascot, click here. This is the time in Spring Training (ST) for reckless prognosticators (like me for example) to just throw caution to the wind and do the impossible: predict who (when I know it’s too early for a sane person to make any predictions:) will make the 25 man roster as position player subs. First, a little math: assuming the Nats carry 12 pitchers (5 starters and a 7-man bullpen) and 8 starters at the 8 positions in the field besides the pitcher, that leaves 5 bench-warmers. 1. Jose Lobaton, catcher. This is a given since the team made it clear when they traded for him that they expected Jose to be the backup to Ramos. Every team has to carry a backup catcher. The Nats will have plenty more of these at Syracuse and Harrisburg, should something happen to upset the plans. Note: Jose is not impressing anyone yet with his lack of hitting! 2. 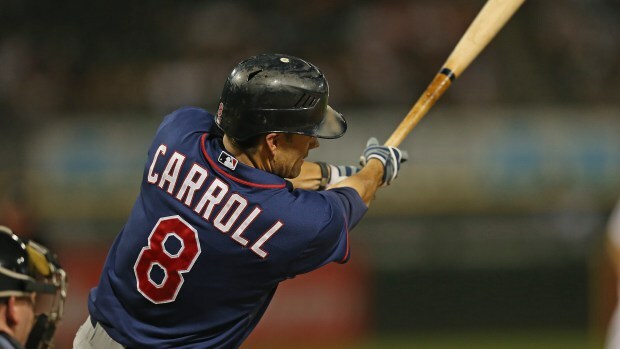 Jamey Carroll, infielder extraordinaire. He reminds me of myself, low on talent and size, but a 100% “gamer.” He does all the little things very well. Also, Matt Williams knows him well (from their days together with the Diamondbacks) and clearly likes him a lot, just look at the playing time he’s getting! 3. Jeff Kobernus, OF AND (!) INF. Like Jamey except he is even more versatile in that he can hold the fort in both the infield AND the outfield. He has been hitting consistently since day one of ST.
4. Zack Walters, infielder. He played well last September and has shown me he is ready for prime time this Spring. Note: there have been several other youngsters who have shown great talent this ST but Zach (like Ryan Zimmerman several years ago) is the most “ready” of them all, with an OBP (on-base-percentage) well north of .500 at this point! 5. Nate McLouth, outfielder. Nate had a helluva comeback year with the Orioles last year. He can hit, play OF and run the bases much better than average. He would possibly be the best 4th outfielder in baseball. Who does this leave on the outside looking in? Tyler Moore and The Danny. 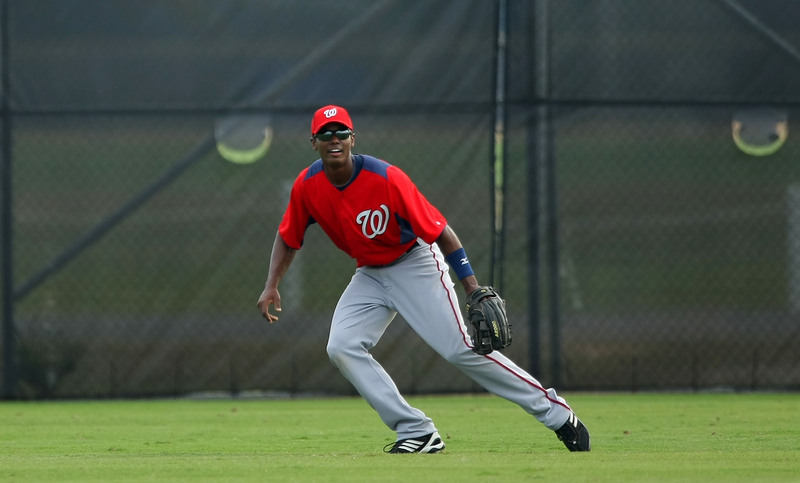 The Nats have been very patiently giving both many chances to make the team, but I say time has run out for both. Neither one is looking good with the bat. No, I’m Not In Bed With Las Vegas! Michael Taylor in centerfield. 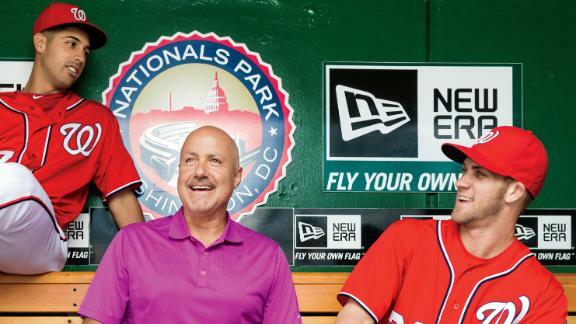 Photo courtesy of Curly W, the official blog of the Washington Nationals. I noticed recently that Las Vegas has the Gnats (ooops, I meant Nats) winning 88.5 games this year. This seems right in line with my own guesstimate of 88-92 wins in my initial post. Everything will have to go right, I think, for them to reach 92 wins–no major injuries; the bullpen performs better than it did last year; Espinosa learns how to hit major-league pitching; Harper and LaRoach improve against lefties; and all the pitchers finally learn how to hold runners on base. That last point is a real sore-point with me (as a former pitcher in college and semi-pro who LOVED picking sleeping base-runners off). Since early January I’ve been participating in indoor baseball practice with about 30-40 local players and I was chatting this week with our infield coach (who is a former professional minor-league player who is about 30 years old) and the conversation went like this: I asked him what he thought about how bad the Nats pitchers are at holding runners. He reacted by rolling his eyes, then told me he had played with a few of the very Nats pitchers I was referencing. And after he muttered a few choice, unmentionable, epithets I got the clear impression he was as annoyed about this as I was! It was wonderful to watch parts of the first Nats Spring Training game yesterday! Not much to say other than that. But one thing really made an impression on me. I had had no idea what all the chatter about Michael Taylor was about, and now I KNOW. His triple, to win the game in the 9th inning, let me know in dramatic fashion that this is a player to keep an eye on! Taylor will likely be playing this year with AAA Syracuse, but he may be making an appearance with the big boys in September.